Let's face it, those 2 barrel carburetors have been a disaster to keep running correctly. Computer controlled Fuel injection is less sensitive to shock and vibration from extreme 4 wheeling. Systems include all necessary components: 2 barrel TBI unit w/ interal throttle position sensor, idle air controller, and on board computer (no programming required). 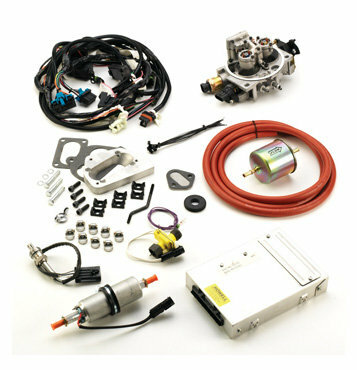 All components are reliable off the shelf parts found on many American vehicles. If you want better driveability, improved fuel mileage and less maintenance, this is the way to go. Emission legal under CA EO #D452, for street use. 90 Day Limited Warranty, Computer Warrantied for 6 months.